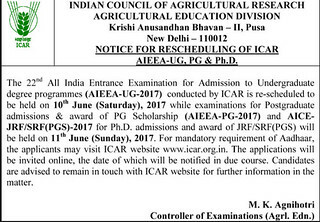 Indian Council of Agricultural Research (ICAR) has re-scheduled the examination date for admission in their UG & PG courses and now examination for UG courses admission will be conducted on 10 June (Saturday) 2017 and examination for admission in PG courses, PhD Admission and award of PG Scholarship, award of JRF/SRF/PGD will be conducted on 11 June (Sunday) 2017. In a case of any query related to this news, write to us in the comment section below. Courses after 12th Science that can lead to High Salary Jobs!